X marks this spot and it never erodes! 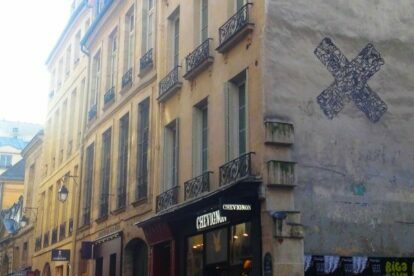 The first time I spotted this ‘X’ on the wall was when eating at one of the Paris’ night restaurants. The restaurant is in one of the city’s gourmand locations at rue de Tresor in the 4th neighbourhood. I already knew about the artwork from a time when a tour guide took me along to explore the city. That was a few years back, and so I was glad to see another one of the famous Tic Tac Toe images. I’ve seen other ‘X’s that mark the spot. Also the ‘O’s of this puzzle too. O-X-O. At this particular spot I really see the ‘X’ as having a harmonious link with the design of the steel balcony. A sympathetic design feature in-keeping with the architecture, in tune with the concrete landscape as if intended as part of the architect’s original plan.